The drive into PA was filled with glorious rays of sunlight. The hilly landscape blanketed with shades of yellow, amber and gold. The forecast, although ever changing, foretold of at least several days of warming temperatures and only slightly cloudy skies. 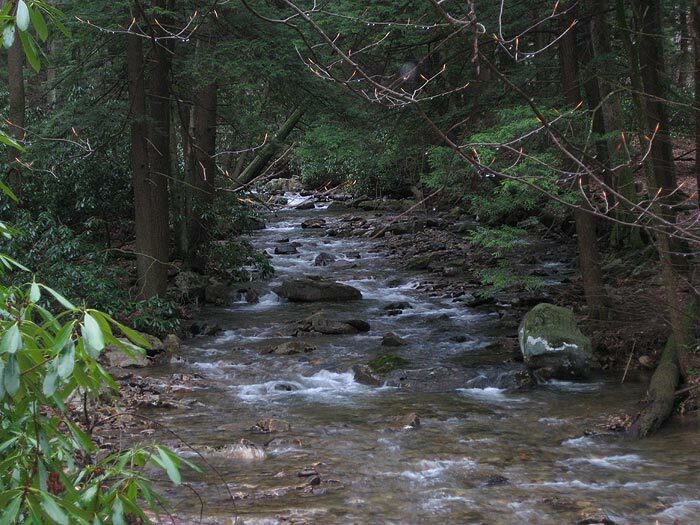 Knowing that this was merely a guess and nature’s path is always filled with twists and turns, I knew that regardless of what we’d encounter, there would be streams that would fish and fish that would be willing to play. Prior to this day, the months before were a stream of never ending reminders of the time yet to elapse to this point. Winding the roads of the turnpike, my mind wandered to past outings and fishing excursions. My friend Jim appeared in many of these fond memories. Beside the love of the trout, the sharing of good times with close friends was all the motivation I needed to press down further on the pedal. Besides the momentary stops forced by toll booths intent on robbing my wallet of mass quantities of undeserved forfeitures, time was on my side. I quickly turned 3 hours and 15 minutes of projected travel time to 2 hours and 45 minutes of expediency. Pulling into the state park, I quickly recognized the clan at the cabin. Float greeted me from afar with a wide smile, I signaled my approval with a quick thumbs up…I was home! In ceremonial fashion, I drove smiling past the crew on my way to the park office. Darn it if I didn’t miss that turn that would lead to the cabin again this year! Quickly unpacking and sorting things and stowing into their appropriate spots, I was greeted with a directional finger pointing toward the cooler filled with several cases of mandatory refreshments. Oh yes! The beverage of choice for me was one of PA’s finest and well anticipated! As my first swig turned into a long gulp, it was evident that the week of fun and festivities had just begun! 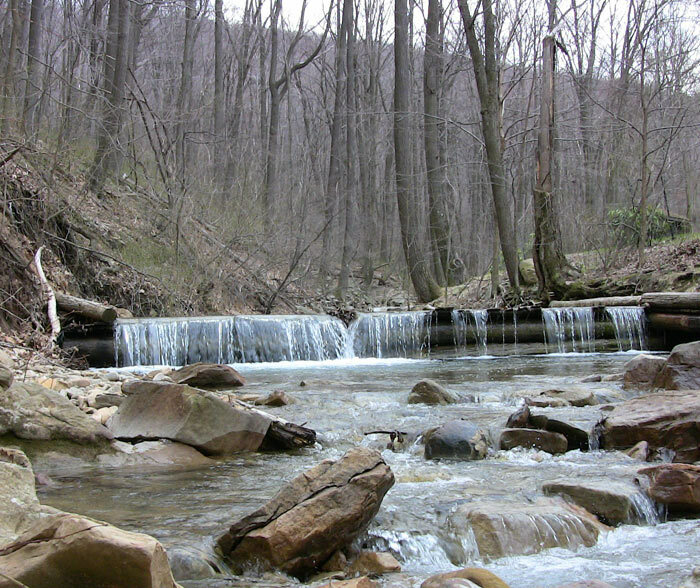 Conversations of the trip into Trout Camp quickly turned to the itinerary of locations and events that would fill the week. 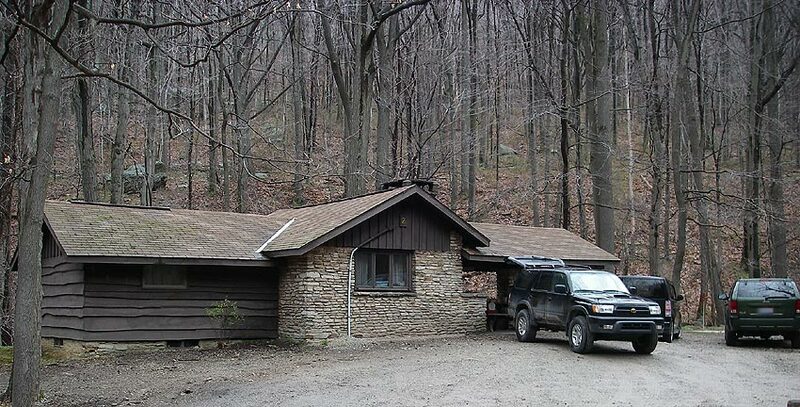 Although it may seem like everything is laid back and done on a whim, the fact of the matter is Trout Camp is regimented; we’d fish specific locations on certain days without exception. 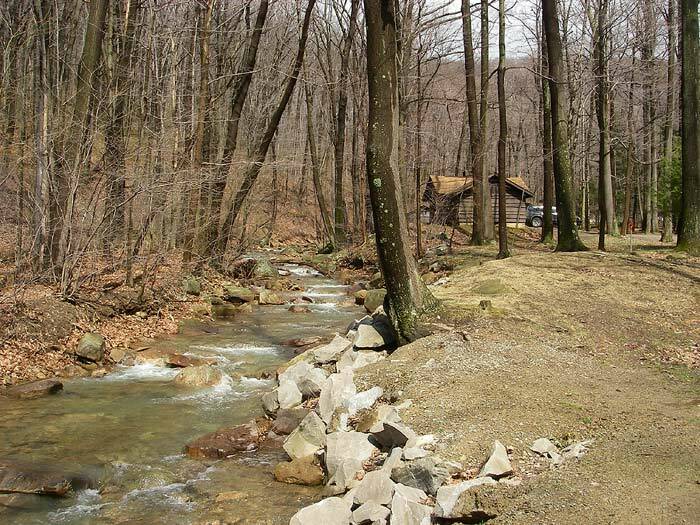 There was the opening day hole, the cemetery hole, the “home waters” stream, the stream outside the cabin, rainbow gardens, the rainbow hole among many others. Being the newbie, I had no say in where and when and to be honest it made no difference to me. A riding joke of the week was the weather. Oh, how the forecast had changed from the previous week! To be a bit critical, the forecast had changed daily. Do these people even have a clue? With a several million dollars worth of equipment, more equipment than it took to launch the Apollo space capsule, you’d think that forecasting would come close to being accurate at least fifty percent of the time. Wishful thinking I suppose. In any event, it made little difference. The swings from seventy degrees and sunny to thirty degrees with snow and hail did little to discourage the trout from accepting our offerings. No matter where we went, with a bit of patience, several species of them would be brought to hand. 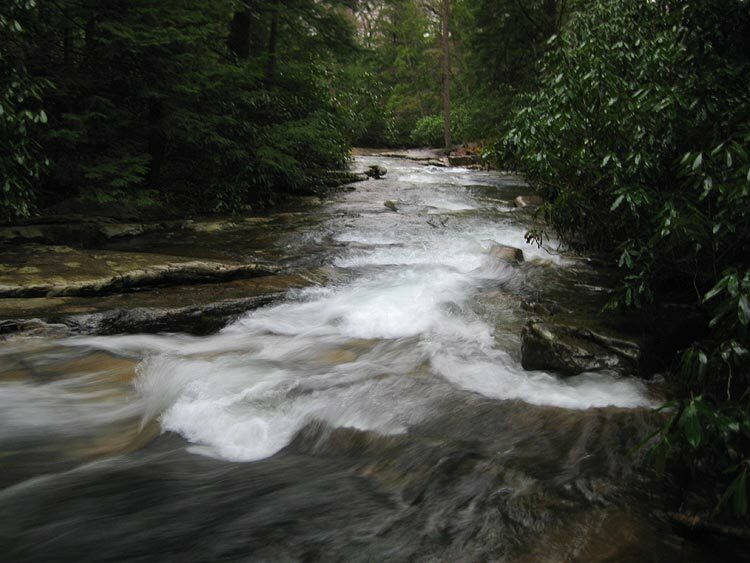 In thinking about it further, the valley and surrounding streams we fished needed water. The intermittent rains and swings in temperature was just enough to bring the levels up to where they should have been and stain the water just enough to make the fishing interesting. Surprisingly, regardless of the rain, none of our destinations got remotely close to un-fishable. This trip had me on the pin full time. I brought along the split cane, thinking I may find time to use it, but that time never came. 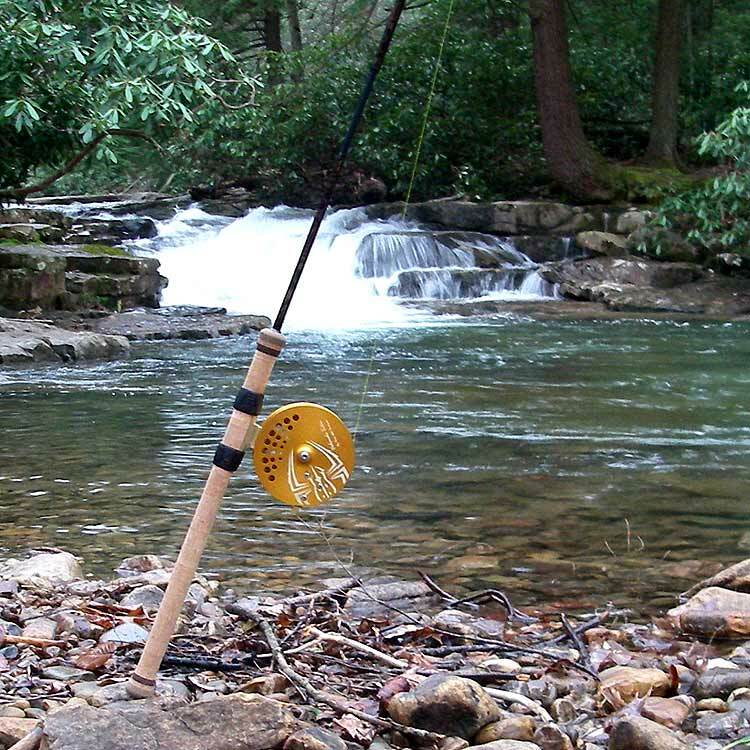 I was fortunate enough to have the luxury, and I do mean luxury, of fishing a Paine Falls Centerpin custom and in a four inch diameter. Dolomedes Triton weighed in at 7.85 ounces loaded with line and backing and performed exactly as I envisioned a creation built with Adam’s expertise would perform. The reel displayed startup without hesitation, trotting void of mechanical resistance of any kind, and pure fishing fighting authority. And to top it all off, it looks fantastic! 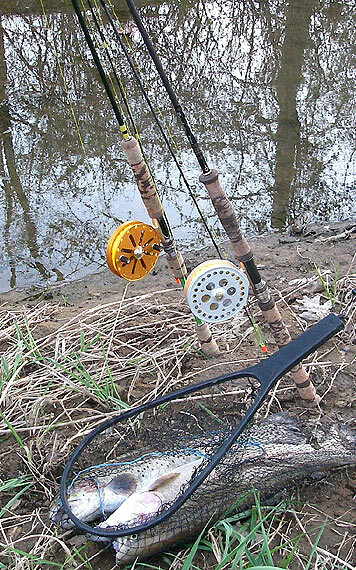 The reel was switched between a 9’ 4wt conversion and a 11’6” 4 – 8 pound rod dependent on the size of the stream and the bank-side vegetation. In review, the rods and reels I chose to pack worked out perfectly given the areas we fished. Opening day hole can get crowded. The sum of the quantity of fisherman is based on an equation that accounts for humidity, temperature, stocking summaries, preliminary forecast, and so on. The amount of individuals occupying this stretch can vary from several to several dozen. You never really know until you pull up and put in. As we parked to the side of the road and suited up, it was apparent that this day (unless the caravans of fishermen were running late) would be light in the way of fishing pressure. The four of us quickly made our way to our preferred locations and counted down the time. It is difficult to say what takes longer, the duration of time until the 8 o’clock bell rings or watching a garden snail finish the l00 meter dash! Nevertheless, the time to legally fish came and I happened to be the lucky one to land the first fish. Not that this was a huge accomplishment as a dozen or so fish were taken out of the hole in a matter of minutes. 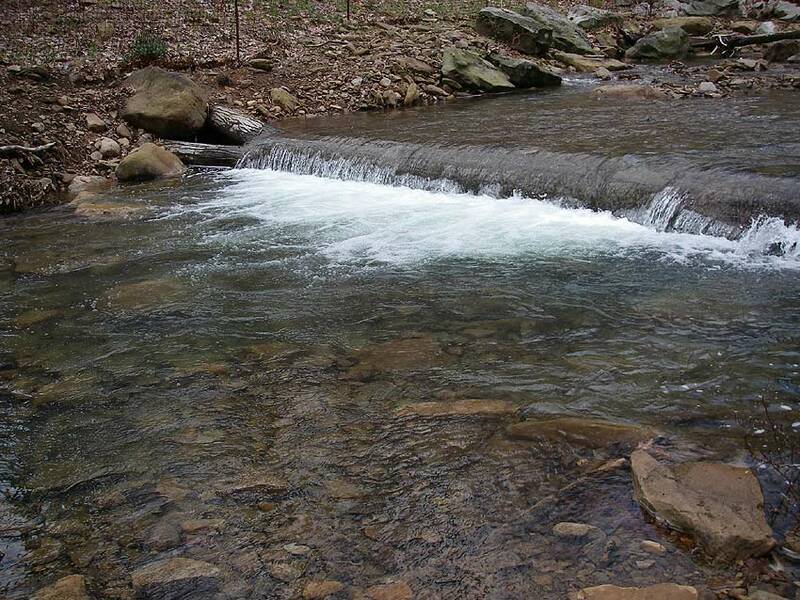 I favored a stretch with depth, plenty of large boulders filling the bottom and offering the safety of structure, just downstream of a fast run of riffled flow. 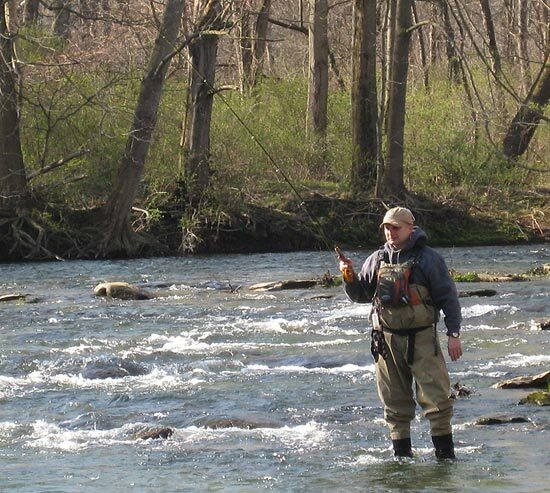 The previous year and under similar conditions (flow, clarity, and temperature) this faster area at the leading edge of the head of the pool was chocked full of browns and bigger bows. Even after several days and many fishermen, there were still fish to hook in this particular area due the factors of cover, depth, and aeration. Noon quickly approached and the hunger pains along with it. As we retreated to the car, we recounted our adventures for the day. How many hooked, how many fought, how many lost, and how many brought to hand. Parking the vehicle near the cabin, we quickly unloaded the gear and prepared our bounty for cold storage. Lunch was a combination of trail bologna, sausage, pepperoni, cheeses, crackers, pickled horseradish and a cold beverage. The home made Italian wedding soup, guacamole shrimp dip, venison stew, jalapeno cornbread, sloppy joe’s, sugar ham and all the other items, one thing that Trout Camp definitely didn’t lack was good food. With this excursion, there were no falling trees, dunks into the drink, slides down cliffs into jagged rock outcroppings. Their absence may not make for good storytelling, but fate excluding these occurrences led to a welcome comfort for the characters involved. What we can recount to you with excitement was entirely the result of Floatman’s fishing prowess. The cemetery hole is long moderately wide flat run. Beginning at the bridge and walking upstream, one is presented with a stretched pattern made up of an elongated tailout, belly and head. 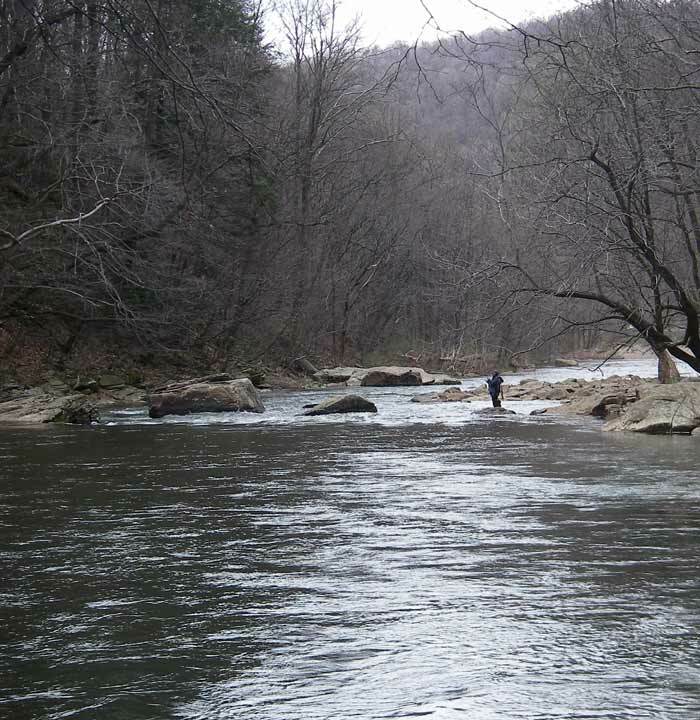 In between, there are several small pockets created by stone and fallen timber, but the location that draws most anglers is a downed tree with a root ball not quite ready to release its hold on the far side bank. The diagonal angle that this tree drapes out and into the water has created a deep hole that begins just in front of the root ball and slices down the middle of the stream a good 20 yards. Fish enjoy the illusion of protection of the tree and its limbs and the depth’s barrier from passing shadows. Needless to say, Floatman and I tend to beat this area down in search of fish as he and I have both noted, it tends to provide a rather large bounty of fish. Little did we know that this day it would spew out an overflowing treasure of trout! After plugging away at the tree and skating our floats along the branches for an hour or so, the sun began to set in the distance. As the bright rays turned to muted shadows, the click of the switch to “dinner time” was heard by splashing of fins and the bends of our flexing rods. I plucked several and Floatman plucked several more, but this day would reveal why Jim is “THE FLOATMAN”. Patiently trotting this hole had alerted Jim to the possibility of a breeder as the several subtle takes followed by one or two head thrashing tugs of his line described a fish that easily tripled the size of the little guys we were bringing to hand. After a few more drifts through the same location, it was “go” time. 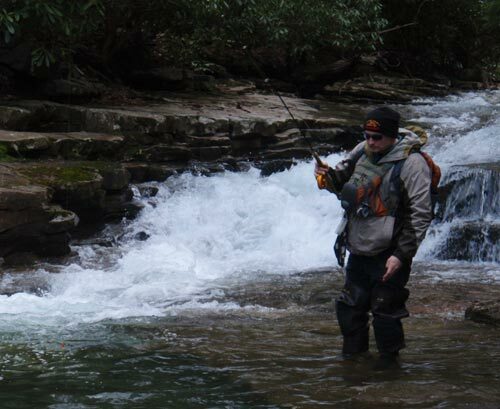 Floatman quickly set the hook on what could be best described as a “steelhead” in stocker trout water. 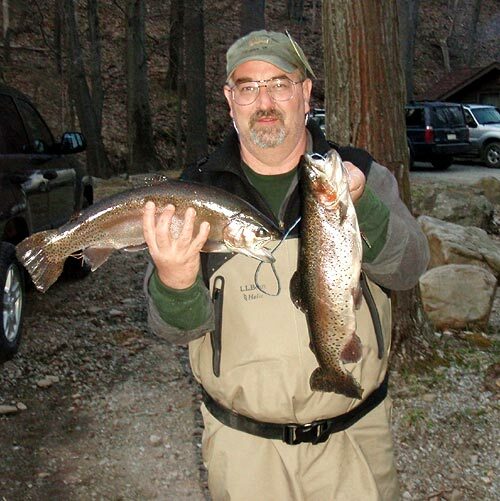 His 3.3# fluorocarbon leader stood the test and the first 22” trout was put into the net. On what seemed like 3 casts later, this scenario repeated. Could this be possible? Two dozen stockers and two breeders later…we stood in amazement. Amazing! Floatman’s encore would come a day later at the “Rainbow” hole. This is big water, fast current, and car sized boulders in pools that would swallow fisherman and spit them out hours later. The rains of the previous night had the water up to normal levels and the clarity about as perfect as it gets. After gearing up, I carefully descended a shear cliff to the river’s edge. To the left of the SUV was my crossing point. The year before I attempted (successfully) to cross just above the “Rainbow” hole and walked up the opposite bank with my heart beating frantically and through my veins the adrenaline pumped vigorously. I didn’t wish for a repeat and had chosen a crossing point that although slimy and slippery, had reduced current and less killer instinct to its nature. 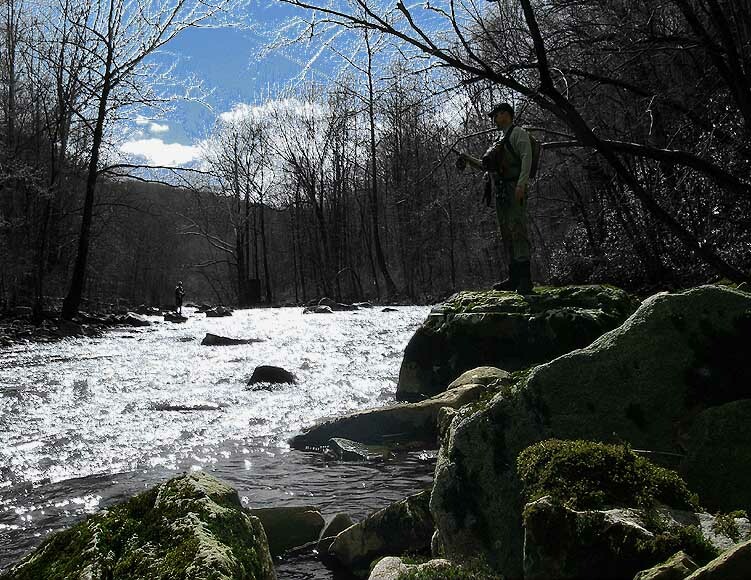 I fished a location near the crossing point and pulled a couple fish, but further down the river toward the other’s was a gorgeous rock outcropping that stood 20 feet above the river’s surface. From this vantage point, a drift could be laid into another county; trot through a swim so long that you would really have to dial a (1) plus the area code to set the hook! And so I did! 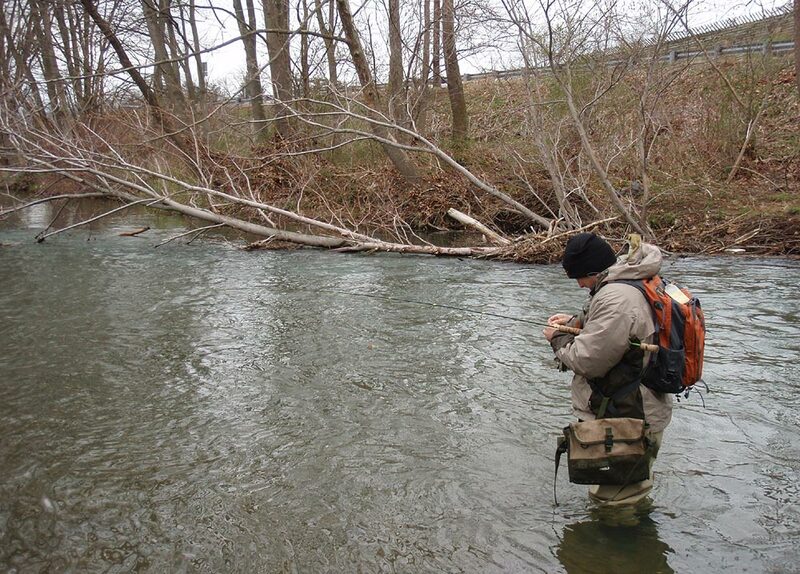 Several fish were taken at near 75 yards down river along with the usually directly at my feet and near shore. From this high perch I was able to view a Palomino trout. Its striking colors of orange and white stood out like an orange construction barrel fluoresced at night by halogen driving lights. I pointed out my find to the anglers across river. 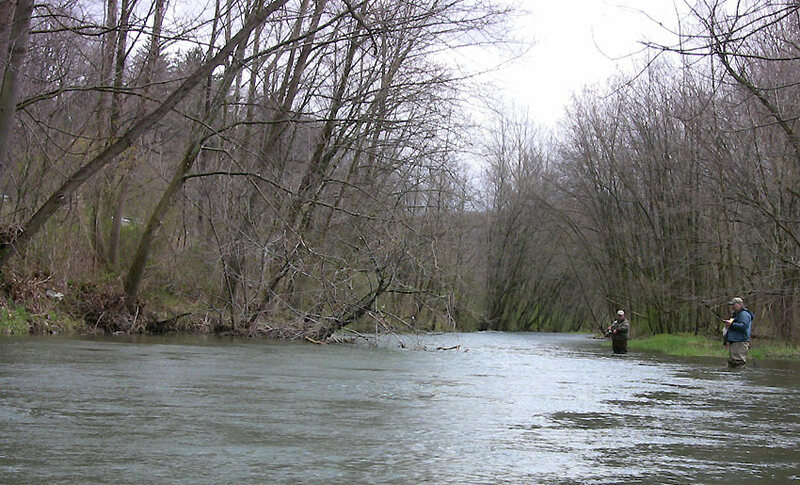 Over the roar of the river, I used hand signals to describe the fish’s length and screamed to Floatman, “Palomino!” We alternated drifts, but Floatman was the lucky one again! Seeing the fish jump was amazing. The full body shots against the sun’s glare where the perfect contrast for me to properly admire the silhouette of one huge trout! A short battle ensued with the 3.3# fluorocarbon succumbing to the shear thrashing strength of a fish none to happy to be hooked! It was a sad moment, but one we quickly laughed about as Float’s knees could be seen knocking together from across the river! Yes, even with years and thousands of fish landed, some that would easily be called trophies by many, this experience was one of those destined to become “legend” and retold out of appreciation for the love of the sport. A routine was established after just the first day. Get up, fish, eat, veg. 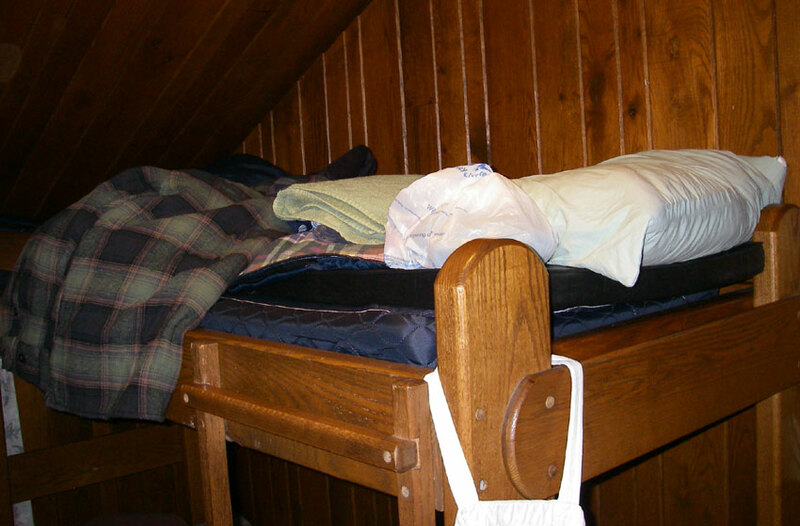 out/quick nap, venture out, fish, eat, and then maybe the local tavern. We started the week strong and full of energy. The tiring routine made the days melt into single fond memory. In the end and in summary, this trip would be one of those that we would talk about for years to come. I was just glad to be part of many of those memories. Until next year my friends, Jim, Dan and John….THANK YOU!